After having recently traveled extensively across Laos and Vietnam, I can personally attest to just how much technology plays a role in the planning and management of a travel experience. More so than I’m sure any of us stop to think. Though with the sleuth of technology, tools, services and apps at our disposal nowadays, it can often be an intimidating concept figuring out which to use to enhance your adventure and make the planning process a breeze. It’s a no brainer that technology has become pervasive in our every day life. At a basic level, most use travel gadgets to book their flight or hotel reservations through sites like Kayak or TripAdvisor, and almost everyone now carries a smartphone…even as it would seem, my tuk tuk driver in Laos who spent more time using his iPhone than watching the actual road! Google Travel is immensely helpful when it comes to prior planning. It presents you an interactive map which shows deals for destinations all around the world. In 2011, Google bought ITA, a travel service that provides flight information to sites such as Expedia, Kayak and Priceline. So you are looking at the ultimate source of ticket pricing here. 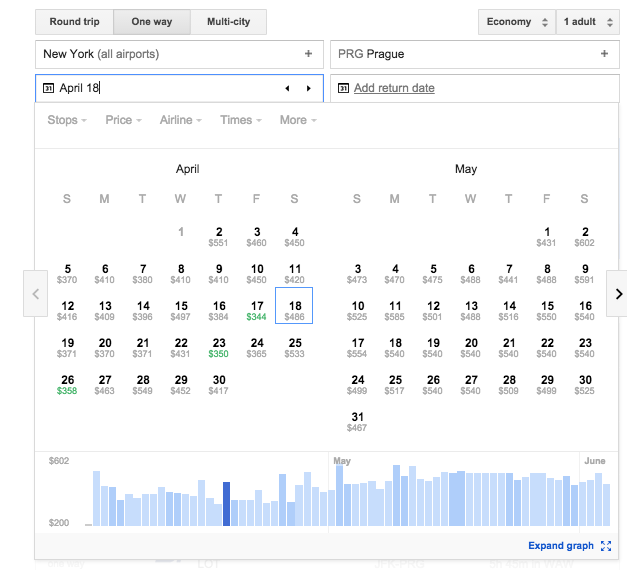 Google Flights site shows prices between NYC and Prague in the months of May and June. If you are a young solo traveler it makes perfect sense to stay somewhere with the opportunity to meet other young travelers. In Laos, staying at a hostel or homestay is preferable since it is incredibly cheap. And guess who likes to travel cheap? Young travelers! TripAdvisor is the leading online tool for performing research on accommodation and reading traveler reviews prior to booking them online. Booking.com or Orbitz are great a tools for comparing hotel ratings, prices and reading customer reviews. Airbnb lies somewhere between a sharing situation like a hostel, and a hotel where you have complete solace. You still have the opportunity to meet interesting people while staying at accommodation listed on Airbnb. Generally most places on Airbnb have reviews from other fellow travelers, which can help you make the right choice in terms of comfort, location and price. Airbnb: somewhere between a sharing situation like a hostel, and a hotel where you have complete solace. 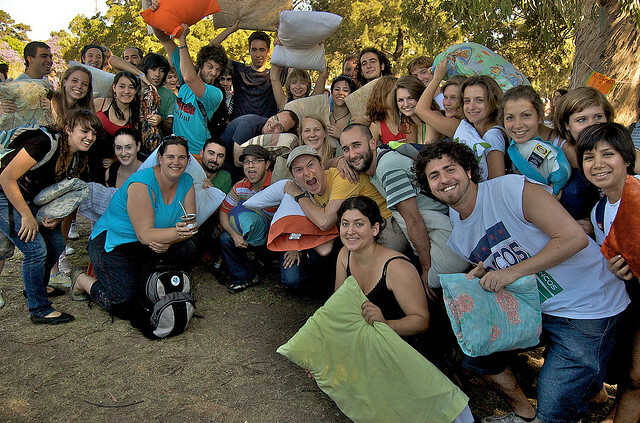 CouchSurfing is a global community of 10 million people that connects travelers with local hosts, and guests stay with locals for free. This provides the opportunity for cultural exchange between guests and hosts, and has truly revolutionized the world of travel. Traveling across China in 2013 presented the perfect opportunity for cultural exchange through Couchsurfing in Shanghai and Beijing, and it was truly a great experience. I still keep in touch with the folks I met during this travel. However a note of caution. It is advisable for single female travelers to stay with other female hosts and get a good confidence level through interactions prior to their stay. Read: Couch Surfing! Another Accommodation Option! Couchsurfing Pillowfighters. Photo CC by Beatrice Murch. After having reviewed your destination on TripAdvisor, Wikipedia is then a fantastic source for more in-depth historical information and quick factoids. Questions about Vietnam’s history? I hit up Wikipedia. Sometimes you can corroborate facts with what you learn from your tour guide. For instance a guide told me Halong bay has over 3,000 islands (karsts) while Wikipedia mentions 1,600 limestone islands. Another great source of information for research are travel focused blogs and websites like this one. Personal blogs provide an individual traveler’s true perspective on living and experiencing the local culture and lifestyle. 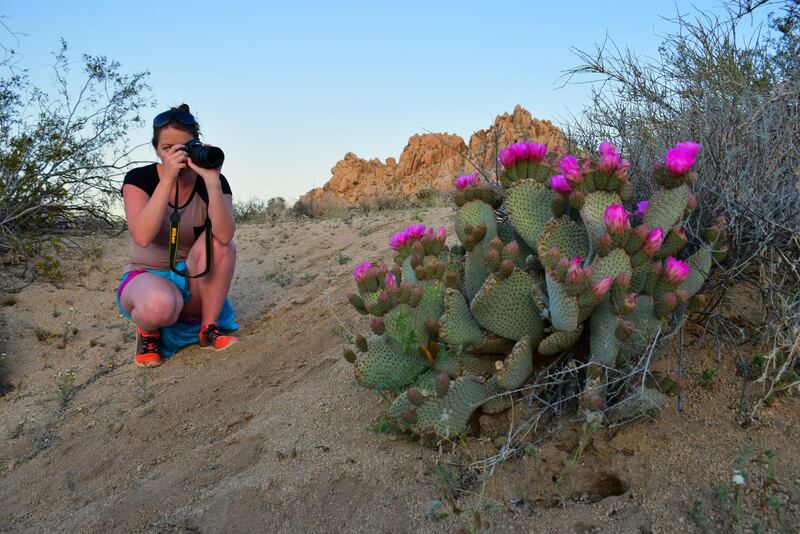 Photos on these sites add color to the travel experience so you can picture what to expect. While the iPhone is very handy when it comes to capturing those unforgettable moments, and has a surprisingly decent camera, it does have limitations when it comes to taking quality photographs. The depth, resolution and brightness range a typical smartphone offers cannot match a professional camera like a Nikon, Cannon or a GoPro. For more tech savvy folks who want a state of the art camera with built in Wi-fi and GPS, look no further than the Nikon D5300. It not only takes amazing pictures but also connects with your phone or tablet so you can share the photos instantly with your friends and family. Look no further than the Nikon D5300. Travel and adventure go hand in hand. For the adventure traveler who values the outdoors and adrenaline activities abroad, there is nothing better than carrying a GoPro Hero. Perfect for zip lining through the jungles of Champasak, Laos, or even underwater adventures with Galapagos wildlife. This is one item which should be on the top of your shopping lists yesterday. Depending on what you’ll be using it for, there are also a wide range of GoPro accessories to consider too. 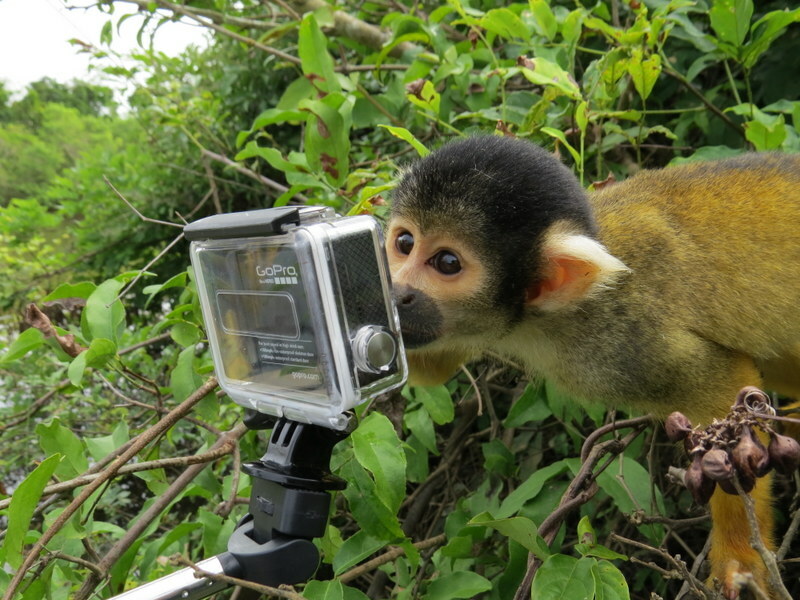 Read: The Time Amazonian Squirrel Monkeys Stole our GoPro. This is one item which should be on the top of your shopping lists yesterday. Use a cloud hosting service integrated into your phone or on your computer. If you are a fellow iPhone user you might want to look into Apple iCloud, while Android users can take advantage of Google Drive service which provides much better value for money. Both services integrate really well into respective platforms/devices. Sign up for a low cost hosting service like Fatcow which provides you a free FTP server with plenty of storage space. Use Filezilla FTP client to auto sync the files in your computer to your FTP site. This is a great option for transferring content in bulk, though the caveat is that you have to first transfer files from your smart phone to your computer. Do you know most smart phones have built in GPS? Google Maps work off satellite signal meaning that you can still use the GPS even without a data connection. All you have to do in turn on your Wifi and it shows your current location and tracks your every step. Awesome and creepy at the same time right! Do you know most smart phones have built in GPS? Monthly-prepaid 3G data service in most countries outside of North America costs less than your lunch meal. In Laos it was 10 USD for 1GB data for a 30 day 3G data service (Unitel service), and in Vietnam it was even cheaper – just 7.5 USD for 1GB data (Viettel service). This kind of service is extremely useful as you can do research on the go from your phone in locations where WiFi is not available. While abroad you may find yourself missing your favorite TV shows back home. Geolocation detection is a big hurdle in accessing media content (or some sites) in your home country. In order to overcome this hurdle it is necessary to use VPN services like HideMyAss or UnblockUS. The smart device is now your personal navigation + entertainment + media recorder + apps + camera all rolled into one, and you can instantly capture and share your experiences (by words, pictures, videos etc) with the world via Facebook, Twitter, Snapchat, Flickr and a sleuth of other social media platforms. Flickr is much more well equip to share photos than Facebook as it stores and displays your images at full resolution. Facebook compresses it as much as 80%. Skype is great for keeping in touch with your loved ones back at home, and the Skype Wifi app is great for making Skype calls using your Wi-Fi connection. International calls can be as cheap as 3c per minute. Another recommendation is Google Voice. This is great if you are making any domestic calls within North America, as it is free of charge. It’s a no brainer that technology has become pervasive in our every day life. Whatsapp has become the defacto chat application for most smart phone users looking for conversation. This app enables you to keep in touch with the fellow travelers you met during your trip and also co-plan your future travel activities. It is also a great way to share pictures with the strangers you meet during your travels. The Ventoura App operates in a similar way. I couldn’t agree more! Google maps and I are BFFs for sure! What’s App and a VPN client have found their place in my life as well. This post is a must read for any traveler or expat! Oh totally agree Jess – I don’t know what we would do without Google maps!! We’re in Alaska at the moment and our US GPS apparently excludes Alaska from it’s maps, so we’ve been using Google maps via an iPad and it’s seriously saved our life as a tool for navigation!! So glad you enjoyed the post :) Happy travels! I forgot to mention a few more tools and apps in the article. I thought it might be useful for other readers. 1) TripIt which is great for keeping track of your upcoming trip itineraries. 3) Units Plus app – whenever my European friends mention something in metric units, I use this app to convert to our imperial units to get a sense of what they are talking about. Love TripIt too, and the Currency app is also a fab choice, makes things so much easier than trying to convert back to your home currency in your head…especially when the rates change daily! Informative article. Your described all technology are best and I agree with you. Nowadays, One more new technology is popular in the market that is similar to cloud computing that is a Virtual Data Room. It is used as a powerful platform for data storage. According to me, Everyone should know about it because it provides many benefits to us. 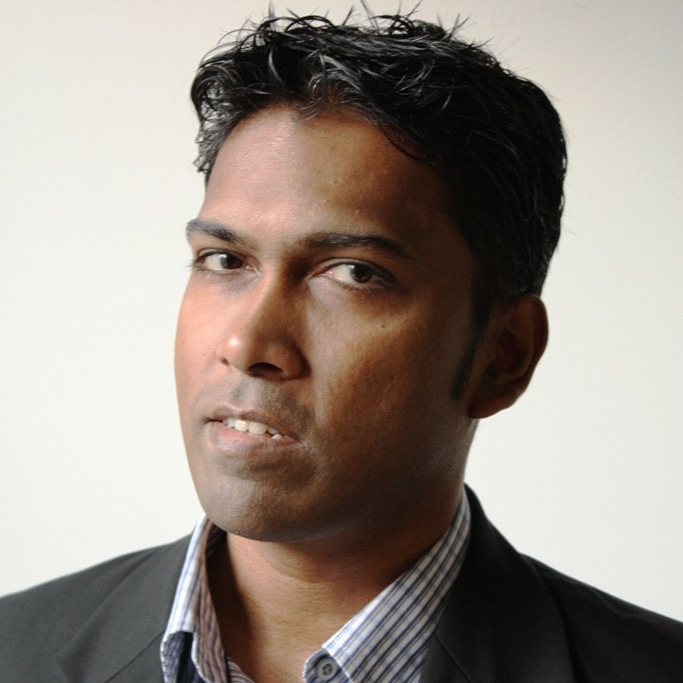 Hi Jonas – Thanks for your comment and the info about the Virtual Data room. I will check it out. It is hard to keep up with the technologies as they continue to evolve and get better. I mentioned Google Maps in my article. But if you want a better mapping tool check out maps.me. Maps.me allows you to store maps offline and use it when you don’t have an internet connection. Thanks for the tip Tim! Hadn’t heard of HERE maps but will definitely check them out- use without roaming is huge; I usually have my phone on flight mode whenever I head overseas because of the ridiculous roaming charges, so I’m all for any app which you can use without running up that phone bill! Hey, This post is about technology to use and make your travel better such a nice post. The sleuth of technology, tools, services, and apps are a great help at the time of need and have adventures. All technologies are very good indeed. Thanks for sharing this great information.